The Social Computing Research Centre at the Cyprus University of Technology provides a select cohort of Postgraduate and PhD students the opportunity to network, expand their knowledge and enhance their skills. 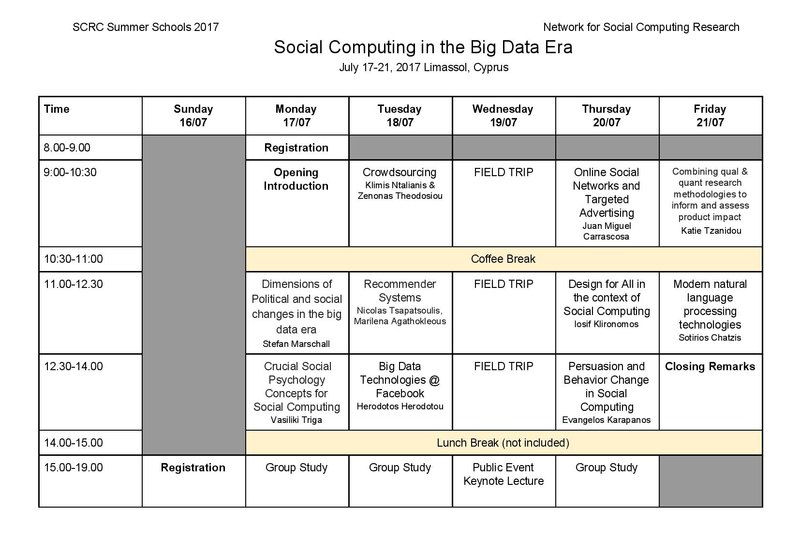 There are two summer schools to choose from under the themes ‘Social Computing in the Big Data Era’ and ‘Usable Security and Privacy in Online Social Networks’, within the scope of the EU-funded projects NOTRE and ENCASE respectively. Both summer schools feature a range of speakers from renowned institutions that include the University College London (UCL), Aristotle University of Thessalonikis (AUTH) and the University of Düsseldorf as well as industry partners such as Telefonica. The summer schools are taught in parallel with intensive morning lecture sessions and afternoon study sessions while one day has been allocated for a visit. All participants, who successfully complete the summer school, will receive a Summer School Certificate of Attendance (6 ECTS) from the Cyprus University of Technology. This project has received funding from the European Union’s Horizon 2020 research and innovation programme under grant agreement No 692058. The content reflects only the authors’ views, and the European Commission is not responsible for any use that may be made of the information it contains.